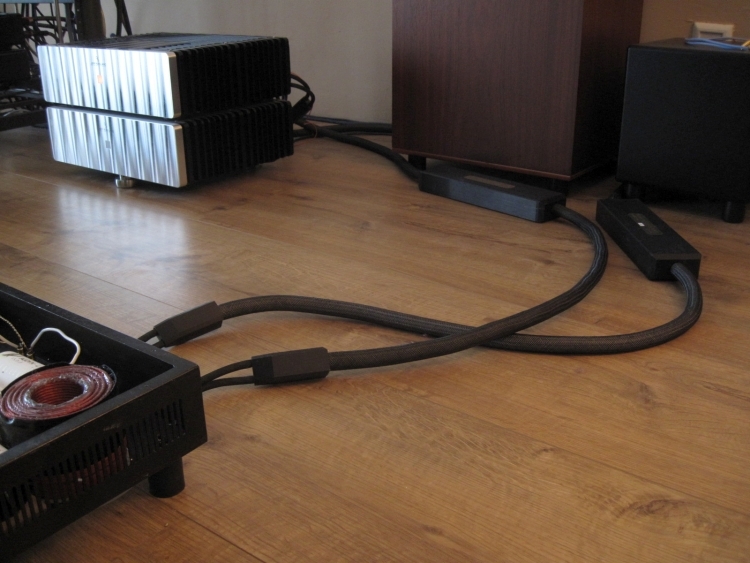 Speaker Cables – bi-wire or single wire? And what about bi-amping? 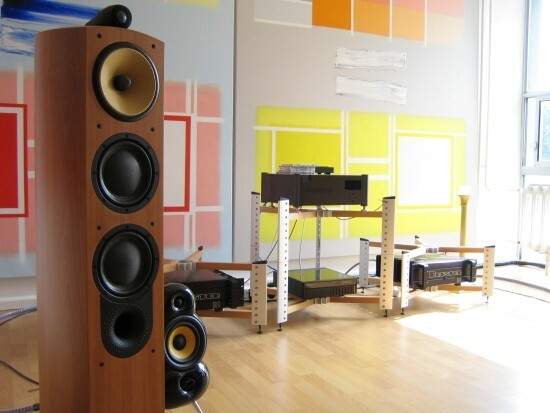 Biwiring your loudspeakers can really make a difference, most people agree on that. But people seem not to agree upon whether the effect is good or bad. Some people swear by single wire, some people believe biwire is better and some manufacturers leave this in the middle and simply provide the biwire terminals for commercial reasons. No matter which method is chosed, do be aware that there really is a quite distinct audible difference. 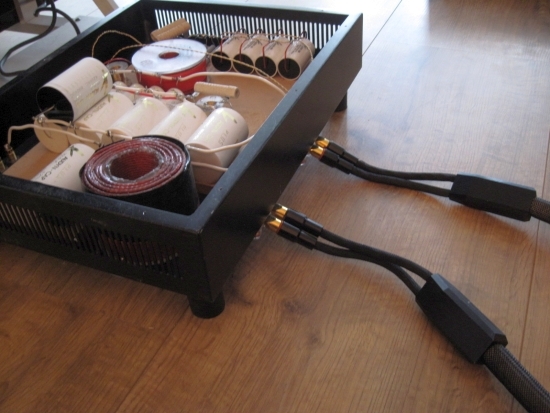 Biwiring means using separate cable runs for the tweeter and woofer of a loudspeaker in which the cables run in a uninterrupted length from amp to speaker. Incidentally it is not called bi-wiring if there is just one cable that is being split right before it connects to the speaker. 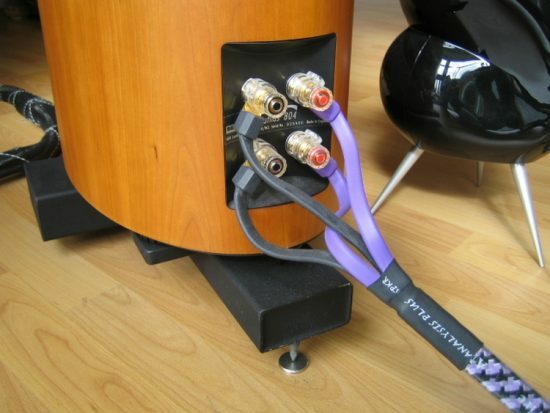 Alternatively using a bi-wire cable that has 4 connections at both sides, you can also connect separate amplifiers to the woofer and tweeter, and this is called bi-amping. The cable itself would then be called “shotgun”. If you have a bi-wire connection but are using single wire cable, just try running two sets of the same cable. You’ll find that bi-wiring makes the soundstage larger, and gives more air to instruments within the stage. I quite like this effect but some people find this unnatural and maintain that the stage should not be any higher than it would be if the performers were in your room themselves. To me the effects of bi-wiring sound as if the speaker’s drivers have been liberated, them no longer being modulated by each other, or at least less so. The effects can usually be observed with any speaker. 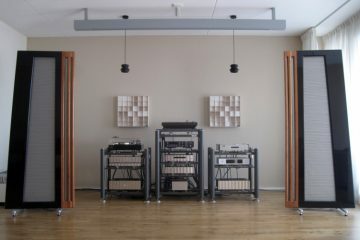 For example B&W Nautilus 804’s portray the same improvements as a pair of Apogee Duetta Signature magnetostatics, and I hear the same improvements with any cable, as long as the same cable is used for the comparisons. Please do note that it’s very important for the high-low coherence that you use the same cable on the low and on the high connections. Otherwise you might get disjointed, out of time bass and/or forward highs. 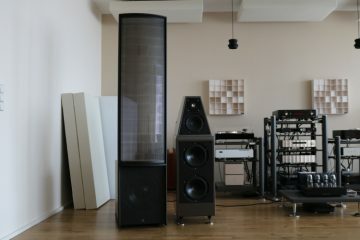 It is sometimes claimed that the perceived larger soundstage is actually caused by phase problems introduced by differences in the cables for high and low. While this can certainly be true if you use different kinds of cables for low and high, it is absolutely not the case if you use identical cables of the same length or a biwire cable that consists of identical wires. 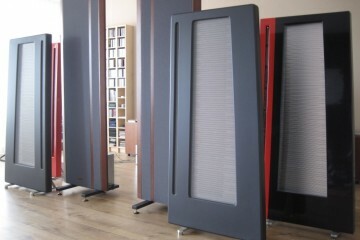 Now, whether you will prefer biwired speakers over the same speakers single wired is completely up for debate and very much a matter of taste. Below are some of my experiences in this field. 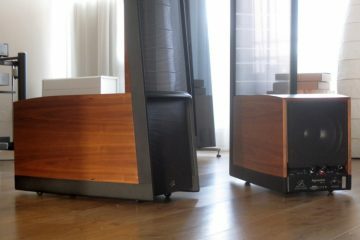 For starters, the matter is investigated using two pairs of Apogee Duetta Signature and a pair of Apogee Diva speakers. 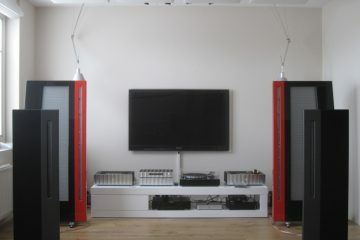 Cables used are Transparent Reference XL and van den Hul Skyline Hybrid. 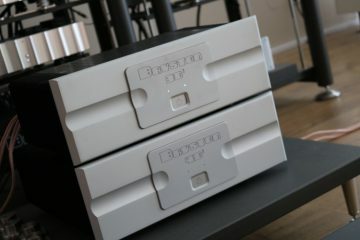 A double set of Transparent Reference XL for the Apogee Divas. A Single Wire set with bridge wires for the Apogee Duetta Signatures. 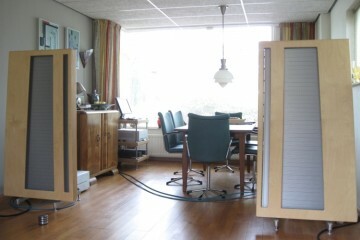 For this comparison I was in the fortunate position to have two sets of the same speakers: one original and one refurbished and the latter also had a newly built crossover. Original Duetta Signatures are now over 20 years old and it is only logical that they sound more relaxed than newly refurbished sets. Nevertheless, it is very interesting to compare the two. Read the extensive Duetta Signature review for more info. As the basis for this comparison, I had made a Y-cable: 2 parallel cable-pairs originating from each single spade on the amplifier side. I first connected only the single runs to treble and bridged the treble to the bass using solid core OFC wire. 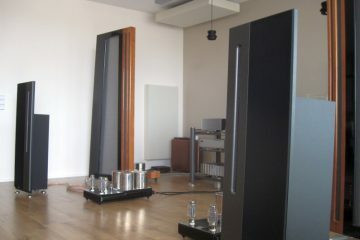 The sound was very refined and nicely airy, but clearly behind the refurbished Duettas in terms of dynamic differentiation and overall sound-pressure. The music felt restrained and soft. Switching to bi-wiring mode but at first still leaving the bridge connections between bass and treble in place, did not make this a bi-wired solution yet but did effectively make for an effective cable diameter-doubling. By doing so, the sound did not improve, but actually got worse as the bass further fattened while the sense of dynamic restraint was still in place. Removing the bridge connections did the trick – believe it or not – but now the sound seemed to be freed from dynamic constraint. 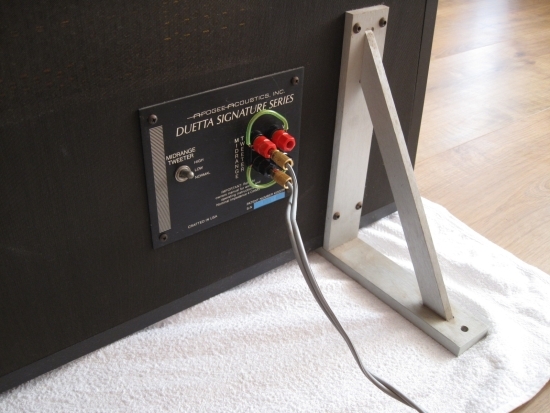 Sure, the refurb’d Duetta Sigs were still the livelier pair, but nevertheless, where the original Duetta Sigs sounded woolly and witheld before, they now sounded nicely open and unrestrained. And pace was better, too! What does this teach us? Well, for one it indicates that with the Dueattas, bi-wiring really does pay off. A bigger copper diameter however does not. I do need to note one small variable that may also play along here, which is the capacitance of the unused cable end in the situation where the Y-cable is only half-used. Sure , the 2,5 meters won’t do much, but I have seen, and heard, stranger things, so it can’t be ruled out entirely. Still: the experiment with removing the cross-connections between bass and treble is very real and unaffected by the aforementioned variable. 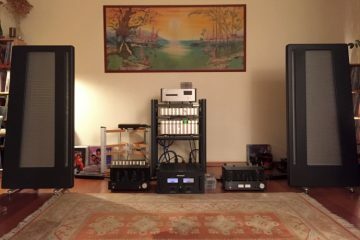 This is quite a rare experiment… or have you read anywhere else where someone has used two pairs of single wire Transparent Reference XL speaker cables? I sure haven’t! And I’m not even sure if Transparent, the company, would recommend this, seeing as the extra cable and its associated network boxes might bring extra loading for the amp to the table, capacitance for example. But that kind of awareness never bothers me and so here goes. Take note: for the Divas, I do use the subwoofers. This is my default situation for the Divas – a single set of single-wire Reference XL speaker cables. 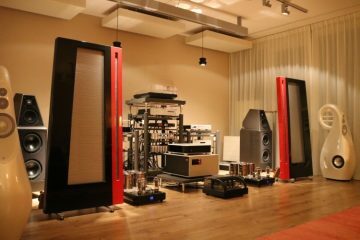 There really isn’t anything to complain about: soundstage is wide and deep, bass is solid and powerful, midrange is gloriously rich yet articulate and dynamically very expressive and treble is sublimely airy. the Bass and MRTW sections are bridged at this time using two short pieces of vdH Skyline Hybrid, which works surprisingly well. (I will conduct experiments using different wire but that’s for another article). Once again: this probably isn’t the same as using a genuine Transparent Bi-Wire cable, but I have never seen this version on the second hand market. The way that I use these two cables now is actually called “Shotgun” Mode: using two identical cables in a bi-wiring configuration. The Jeff Rowland model 6 power amps’ Cardas connectors luckily offer plenty of room to screw in the double spades. Then the listening resumed… hmmm. Wasn’t the bass now woolier and wasn’t the overall sound now less coherent? Yup, it was. There was no denying it: this was absolutely no improvement. I double-checked the connections but I hadn’t made any mistakes. Perhaps the second set of cables needed some running in? They had been lying unused for years after all. I gave the cables two weeks of playing time. And in my situation that means both music and cinema use, so although they may still need more time to fully awaken again, I thought it enough to at least form an opinion, if only based on a still-developing sound. Over the course of these two weeks, I had adjusted to the new situation: near the end of the first week I must admit to not hearing the downsides anymore. In fact at some stage I had actually forgotten that I was conducting this experiment, which is a good sign. Or a sign that I am actually easier to manipulate than I am willing to admit. You be the judge. After two weeks I prepared to revert to single-wire listening and collected a few CDs with which I would make the comparison. After listening to a few tracks, the second set of cables was removed and the vdH cross-connections reinstated. Another surprise: “was there any difference at all?”, I asked myself aloud. This was a tough one. First off: the sound didn’t improve much, which was a sign that the second set of cables did indeed need some time to wake up again and meanwhile had gotten up to speed. But given the experience with the vdH and the Duetta Sigs, I was expecting a huge fallback in dynamic differentiation. Not so this time. In fact: the more I listened, the more I became aware that focus and articulation through the midrange was now better, with the single wire configuration, that is. I then focused on the bass, which I expected to have become less voluptuous. Well, perhaps that was ever so slightly the case, but the difference was subtle. No doubt this was also due to the Rel Strata III subs being in use, but they are only used for the very lowest frequencies and already cut off at 32hz, so there is no way that they would totally obscure the differences between single wire and biwire. They are a factor though, admitted. Moving on to the soundstage, this time I couldn’t detect any difference at all! Not in size, depth, width or imaging. Treble, finally was also identical. So, what’s the use? If anything, it’s slightly deeper/fatter bass when biwiring. 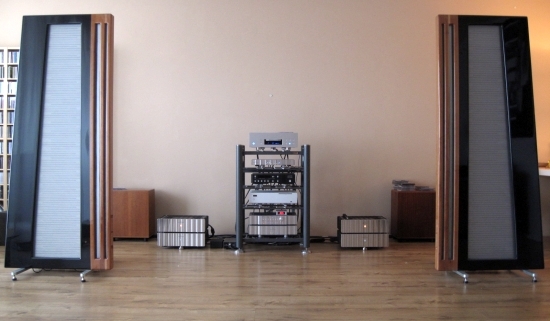 Seeing as the results using the Apogees are so different, I should add that I also conducted single-wire versus bi-wire experiments a long time ago, using more mundane speakers: B&W Nautilus 804’s. At that time, I found that Kimber 8TC speaker cables made for excellent bass but made the treble appear a bit dry. It’s the logical result from using an accurate cable with fast rise-times and a low amount of smear: accurate bass as well as accurate treble. And sometimes we may prefer a small amount of smear in the treble. Anyway, the Kimber contrasted starkly with Transparent, MIT and Madrigal cables, that had lush and sweet treble. But, alas, also bass that was less than precise. So, you guessed it: I tried to combine the Kimber on the bass section with the other cables on the mid/treble section. Indeed this resulted in tight, articulate bass and sweet, smooth treble, but in the process, pacing was severely hampered, the sound now being incoherent and slow, and less dynamic, too! What’s more: even combining Kimber 8TC (on bass) and 4TC (on mid/treble) resulted in a less coherent sound than when using double runs of either 4TC or 8TC. Go figure! To be clear: 4TC and 8TC use the same ingredients, but the amount of wires is doubled. And still I could detect a disconnect between the speaker’s bass and mid/treble sections. So, maybe this is the reason why some manufacturers prefer to employ single-wiring for their speakers? The best cables that I used with the 804’s were Cardas Golden Reference, XLO Signature 5.1, Transparent Ultra XL and Reference XL, and Analysis Plus Oval 8 (shown above). On to the upside of bi-wiring, then! When using the same cable in bi-wire configuration, the 804’s sound larger, freer and they project sound in a taller soundstage. Some people don’t actually prefer this, stating that it is less natural when performers are portrayed larger than life, but I feel that this is a personal matter. For me, the larger sound makes it easier for me to be engulfed in the music and it reminds me more of an amplified live performance. Interestingly, there was also a time when I bi-amplified the 804’s, using two Sony TA-N80ES stereo power amps. The preamp used at that time only had single outputs so I used XLR Y-cables to connect the two left and two right inputs. While I found that the overall coherence and PRAT had stepped back a notch, the increase in authority and power was indeniable! Think about when using headphones and playing really loud music with a lot of bass. Now the bass notes start to modulate the mids and treble, audible from a frr frr sound in the treble along with every heavy bass note. This is normal, because single drivers are used for the entire frequency range. Regular speakers can also exhibit this phenomenon but with a different cause. In this situation it would be the amp that cannot cope with the heavy demands in the bass, and as a result, there is not always enough energy to accurately reproduce the mids and treble, resulting in similar results as with the pair of headphones. In reality, there is a certain dynamic restraint for any sounds produced at the same time as the heavy bass notes. This very effect can be very effectively reduced, or even eliminated, by using separate amplifiers for bass and mid/treble sections. The 804’s are very capable speakers that can play surprisingly loud, in fact, louder than my ears allow. It really was quite an exhilerating effect! Ultimately I reverted to single ampling with a dedicated bi-wire cable because I upgraded from Sony to Jeff Rowland. That in itself brought so many improvements in so many areas that I let go of the bi-amping idea, which really only was beneficial when playing really loud anyway. 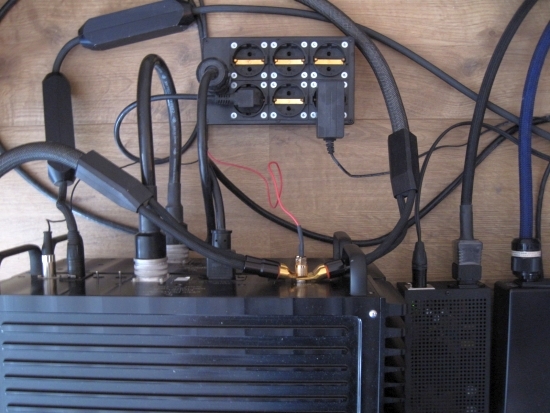 Bi-wiring can absolutely bring big benefits, but this needn’t be the case. Some times the difference can appear very small and sometimes, especially when a non-matching combination of cables is used, it can even hurt PRAT and coherence. For me there was no contest: the B&W Nautilus 804’s clearly benefited from being bi-wired, so long as identical cables were used. Although the Dueatta Signatures also really benefit from being biwired, the story is very different for the Divas. Either they don’t respond much to being biwired, rather than single wired, or, at least don’t exhibit the usual effect of sounding notably larger when biwired. Or, it could be that “shotgunning” 2 Transparent cables really isn’t putting these cables to good use. They might even work against themselves with their secretive network boxes’ contents. Who knows. It could also be that the “bigger when biwired” effect is depleted by the fact that the Divas are already man-high. I’m just guessing here. In any event, the message is to just experiment with it and to go with whatever sounds best in a given situation for a given pair of ears. I have read it’s best to connect the speaker cables to the midrange/treble binding posts and “jump” to the woofers. My speaker manufacturer, Apogee Acoustics, doesn’t recommend this configuration but some folks do. I’d be interested in your thoughts. Hi Gary, in my experience, there is no absolute “best” that is valid for all people and all circumstances. The deciding factor will be whether you care more about treble purity or bass precision. Most bridging cables as well as the addition of extra spades or bananas add a certain zing to the treble and this is heard when the woofers are connected with the speaker cable and then bridged to the tweeters. This is completely removed when reversing the situation. 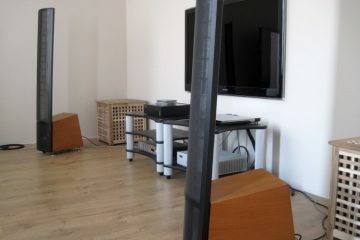 Now the woofers have an extra signal transition but the effect is much less severe and usually no problem at all. Some Apogees take a lot of drive and need the amp to be in control best it can. This may explain why they advise against connecting the MRTW and bridging to the woofer section, likely assuming that the extra bridging connection might not be as reliable or as tight as a direct connection. That said, a lot of what we hear as bass articulation and bass transient tightness, is reproduced by bass overtones, which can often be in the upper range so far, that they are heard through the MRTW. 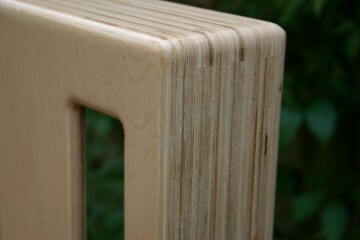 In these cases improving the MRTW connection also improves subjective bass quality. Technically speaking, as long as the connections are safely and tightly made, both methods are equally valid. It comes down to what you hear.